With an unwavering faith & charming southern style, designer Cheryl Luckett has built a brand that is hard to miss & even harder not to love. Southern Home describes Cheryl’s style as “opulence in reach” and I couldn’t have said it better myself. In 2012, she launched Dwell by Cheryl Interiors on a mission to transform her clients’ houses into homes that are not only pleasing to the eye but that provide a sense of well-being both inside and out. For more than 15 years Cheryl worked at a Fortune 500 company in Charlotte, North Carolina as a Registered Dietitian and later a human resources professional in diversity and inclusion. After much prayer and consideration, she realized that design wasn’t just her passion, it was her purpose and decided to take on interior design full-time. With work that has been published in Charlotte Home and Garden, Southern Home, and Hoffman Media’s Southern Spaces to name a few, it’s no wonder Cheryl has been able to parlay her passions into a design brand — a brand with accolades that include being named one of the 15 Best Designers in Charlotte by Build Direct™, serving as Brand Ambassador for NC based Revolution Performance Fabrics, be one of the featured designers participating in Southern Home Magazine’s Julian Price Home Showhouse (Greensboro, NC), and launching the Belle by Cheryl Collection for Sylvester Alexander. With experience in transitioning careers, leveraging social media as a marketing tool, and securing major, long-term collaborations, today’s conversation is one you’re going want to listen to twice — once for laughs, and once for lessons. Cheryl is definitely someone who is a testament to how being true to yourself, following your passions, and putting in the work can manifest into something truly amazing. Right out the gate she imparts on us the importance of celebrating yourself — putting a pause on goal setting (and chasing) to appreciate your accomplishments thus far. Not enough of us truly celebrate ourselves, and Cheryl has had a lot to celebrate — all of which we can learn from. We hear the value is sharing who we are, as people as well as designers, and how that can attract all the right people. We hear how partnering with brands that may not be the largest can yield large opportunities, especially as you grow together. We hear about how all skills can be transferable skills. And we hear how mentorship is a pivotal and necessary part of growth. Gem after gem after gem. 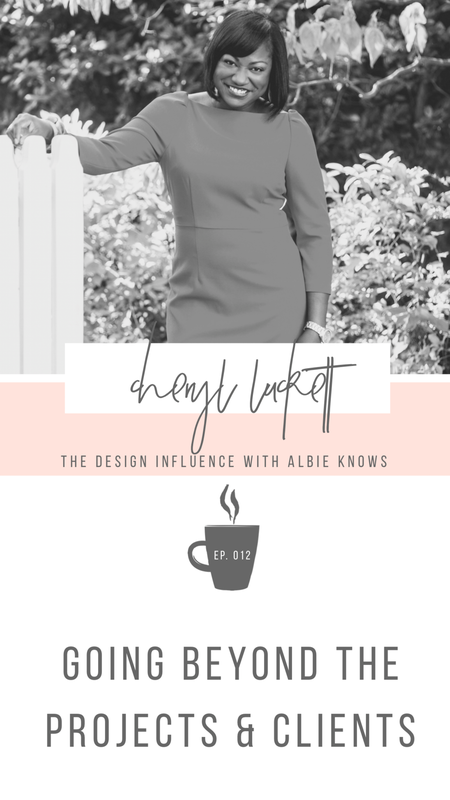 While listening be sure to take a screenshot & tag not only @thedesigninfluence, but also Cheryl, @dwellbycheryl. Share with us what your favorite gem from the episode was. What did you learn in this hour of podcast mentorship from Cheryl, because that’s what this essentially was!